Excitement wasn’t the only thing in the air on an overcast and chilly day at our VZ Environmental office in La Vernia, Texas on Friday, December 15, 2017. 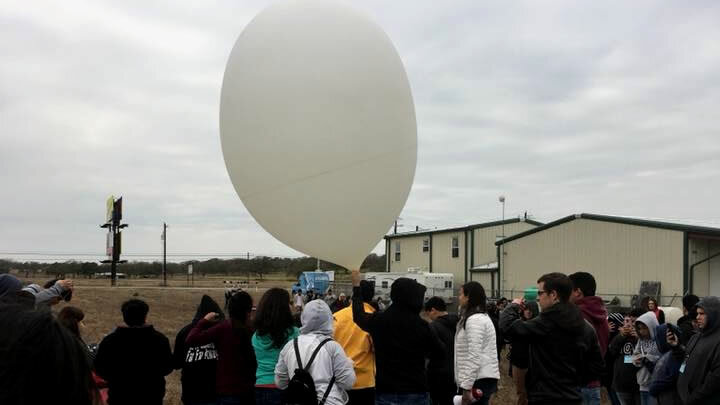 Communities In Schools of San Antonio Space Club 7th and 8th grade students from the four middle schools in Harlandale ISD were launching two weather balloons into the stratosphere from our yard. 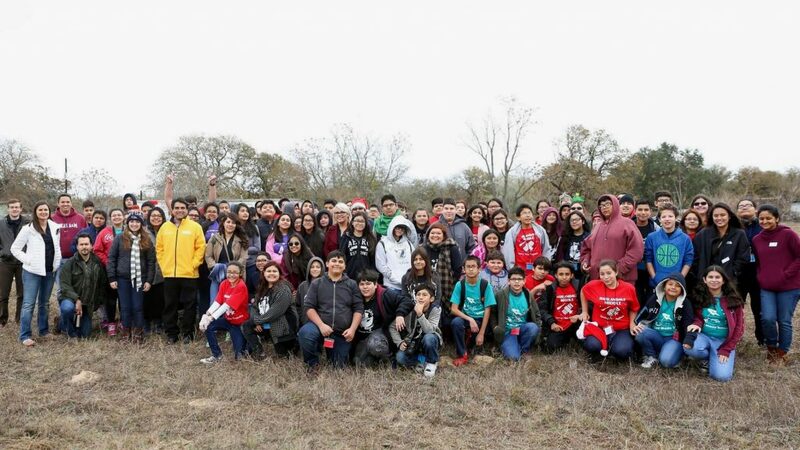 A bundled up and enthusiastic group of about 90 Harlandale ISD middle school’s students, volunteers and even KENS 5 Meteorologist Paul Mireles spent a couple hours with us prior to the launch we hosted. VZ’s connection and support of the event came about through the coordinating efforts of Natasha Wilkerson, STEM Project Director Communities In Schools of San Antonio (CISSA) and Jared Skok of Andeavor who oversees the foundation that funds the STEM Academy which Space Club is part of. We were able to spend time with the kids and learn about and watch what they do in the CISSA STEM program. Carol Van Zandt, VZ Environmental founder, also had the opportunity to share our involvement with oil and gas companies to protect the land in our communities from drips and spills with our modular secondary spill containments, VMatz, during fracing operations. After weeks of planning, learning and hard-work the day had finally arrived! This science experiment is one of many “hands on” projects that students in the Communities In Schools – San Antonio STEM program participate in. The high altitude weather balloons are filled with 80 cubic feet of helium and carry a tethered triangle-shaped platform about 100,000 feet above the ground before they pop and begin their slow descent back to the earth. The students equipped the platform with two GoPro cameras to record the aerial view of the balloons flight; a GPS tracker to track the flight path and locate the balloon once it landed; a Flight computer that will measure temperature and pressure data along the journey; and a 3D model that represents the schools. 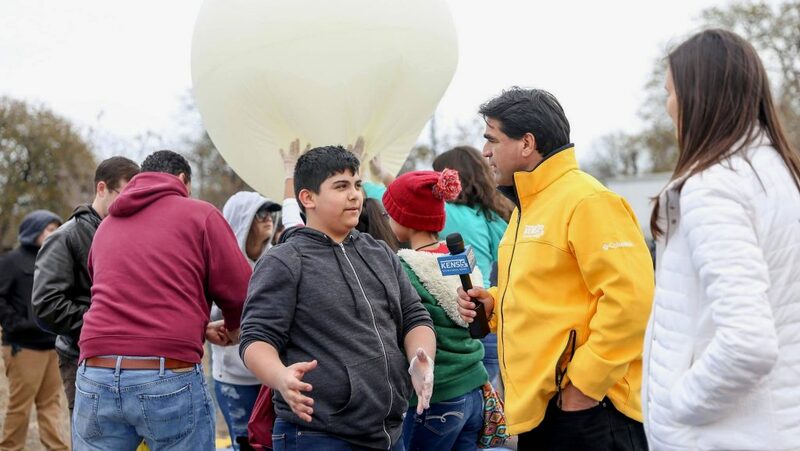 Adding to the overall excitement was the fact that KENS 5 Meteorologist Paul Mireles was on-hand for the launch of the second balloon. Broadcasting live from the launch site he spoke with Natasha Wilkerson of CISSA, and Matthew, a Harlandale ISD student with the STEM Academy Space Club about the project. After completing his current weather conditions and forecast outlook it was time to set the balloon free! You can view the Facebook Live video here. It was a windy (almost too windy) day for the launching of the balloons, but all went smoothly. The whole team counted down from 10 and released the balloon. It quickly rose into the air, catching the wind and sailed away amidst enthusiastic shouts. The launches were a success! It was a great day. Thank you to everyone that participated and made it possible. For over 30 years Communities In Schools of San Antonio has been helping students achieve in school, graduate and go on to bright futures. Their mission is to surround students with a community of support, empowering them to stay in school and achieve in life. CISSA serves 83 campuses in and around San Antonio, Texas. They have worked with over 8,000 students in 11 school districts. STEM is a curriculum based on the idea of educating students in four specific disciplines – science, technology, engineering and mathematics – in an interdisciplinary and applied approach. Rather than teach the four disciplines as separate and discrete subjects, STEM integrates them into a cohesive learning paradigm based on real-world applications. Andeavor is a premier refining, marketing and logistics company. We aim to be better in every way – for our people, our customers, our shareholders, our business partners and our communities. Carol, im very impressed with your web site and you involvement with the STEM program. With all this and your fantastic business, i understand why Jeannie and I can never catch you and Guy for lunch . You both need to visit your Bossier office and see us on the way!! Congratulations on your great achievements. Thank you, Stanley! You’re right! We really need to catch up soon! Take care!